Although asynchronous programming techniques are critically important, they have been strangely neglected in languages and libraries for years. On the server side, they are the way to get the best performance possible, and on the client side, they're they path to a responsive, smooth user interface. The best known feature of C# 5 is its language-level support for asynchronous work, which makes it possible to use these techniques far more elegantly. In this webcast, Ian Griffiths, author of Programming C# 5.0, will discuss these features and techniques. This is the first of two webcasts that Ian Griffiths will present so please register for the second webcast where Ian will discuss a lesser known but very important library feature called RX (short for Reactive Extensions) which provides very powerful abstractions for managing multiple independent sources of asynchronous events. Ian Griffiths is an independent WPF consultant, developer, speaker and Pluralsight instructor and a widely recognized expert on the subject. He lives in London but can often be found on various developer mailing lists and newsgroups, where a popular sport is to see who can get him to write the longest email in reply to the shortest possible question. 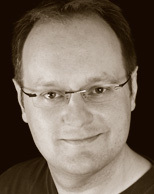 Ian maintains a popular blog at http://www.interact-sw.co.uk/iangblog/ and is co-author of "Windows Forms in a Nutshell" and of "Mastering Visual Studio .NET".